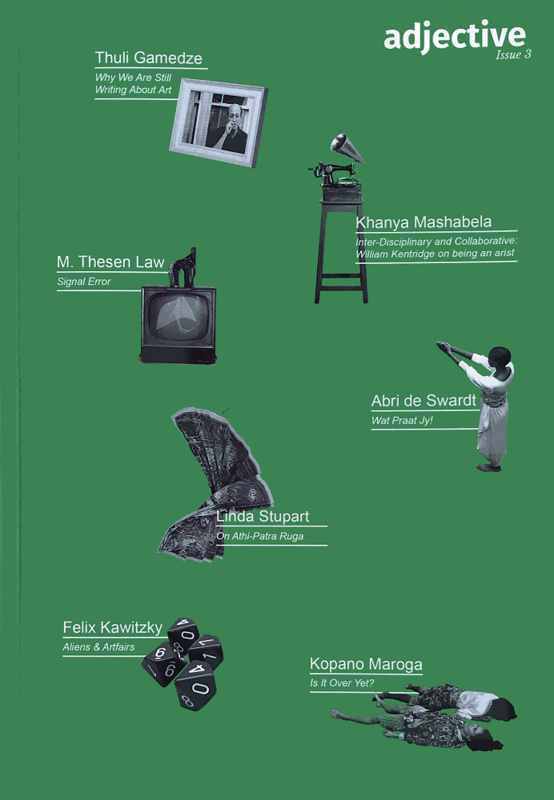 Aside from various, sporadic conversations that question contemporary art on the grounds of its perceived pretentiousness and elitism, there are few critical voices that question the relevance of contemporary art today, particularly in South Africa. This is owing in part to the superficial nature of many artistic inquiries, which don’t seem to relate to any kind of meaningful narrative or formal engagement; much of it is just pure image coupled with support from the market and its networks. Artists, gallerists, curators, writers, publishers, collectors, et al — few seem to notice how disconnected contemporary art has become within the broader socioeconomic and politico-cultural context. There’s ample amounts of discourse out there to support this question: one just has to Google something like “is art dead?” and one will find some interesting perspectives from The Guardian, Huffpost, The New York Times, Artsy, Artnet, and the list goes on. Naturally, this is not a new question; in the past, there was the likes of Jean Dubuffet, who devised art brut to promote what is now referred to as ‘outsider art’ or ‘low art’ (the use of these words is a testament to the narcissism of the art world to this day). So too, dada, neo-dada, and later punk, tried to break away from the confines of the art market and all the élites that it comprises. And there are many more like-minded interventions peppered throughout art history. 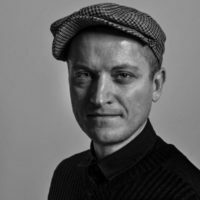 If there’s one thing that this history has proven, it’s that smaller, independent, less commercial publications are able to help remedy this culture-sapping situation by disseminating relevant discourse to the broader public, outside the small sphere of the art world, on the fringe at best. Such publications can appeal to the broader public while maintaining a sense of significance within the fairly-closed system of the art world. It’s a difficult balancing act to uphold but one such publication in SA is Adjective magazine, which has recently published its third issue. Edited by Thuli Gamedze and published by Matthew Partridge, Adjective features a diverse group of contributors, from low-brow to high-brow. Although not detached from the mainstream art world, for the most part, Adjective emphasises more-relevant, -meaningful and -relatable topics surrounding art in SA. Interestingly, all the cartoons in the magazine are by Georgina Gratrix. 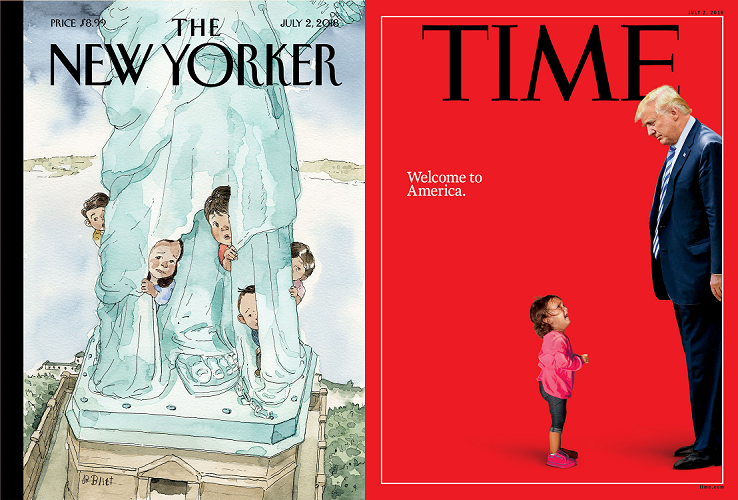 TIME and The New Yorker are two covers that stand out over past week and more in relation to events that were seeded as far back as 6 April this year, when Trump instituted his zero-tolerance policy towards people crossing the border between the US and Mexico. The tragic result of this declaration has been that thousands of children have been separated from their parents. Segregated children have been detained alone, their only ‘care’ coming from American officials. Centres have been created for detained toddlers and infants, where it’s common to hear crying from children calling for their mothers and fathers. Thankfully, the situation seems to be changing, and American authorities may be halting their inhumane approach to illegal border crossings involving families. What this situation shows is that there’s a lack of important values in the minds of those in charge on a global scale, including poor insight and zero foresight, not to mention zero empathy. The TIME cover speaks for itself, but the stronger, more-conceptual, narrative here stems from Barry Blitt’s The New Yorker cover. The legendary illustrator captures the sentiment by depicting a group of migrant children trying to hide behind the Statue of Liberty, a historic symbol for many refugees in the past, and an icon for freedom and liberty the world over. The irony is agonising. An insightful interview with Blitt about the cover from The New Yorker’s art editor, the legendary Françoise Mouly, may be viewed here. The interview includes some of Blitt’s nifty preliminary drawings, which are very informative regarding his creative process. William Morris, one of the founders of the arts and crafts movement, famously stated: “Nothing should be made by man’s labor which is not worth making, or which must be made by labor degrading to the makers.” It goes without saying that having joy in one’s labor assists in the creation of culture; it’s at the core of a healthy society, ensuring beautifully crafted, high quality work. With craft being the operative word, the question then arises: If people were surrounded by beautiful things within their environment, made by people who took pride in their work, wouldn’t their lives, at least in some small way, be better? It’s all connected — art, design, discourse, craft — in relation to economics, science, etc. Dumbo Feather is a magazine that propagates this understanding, following the belief that craft can make the world a better place, with an emphasis on passion, purpose, and community. The magazine provides a storytelling platform in the form of uncensored interviews with global makers (“extraordinary people”) stemming from varying fields, from architects to bankers. 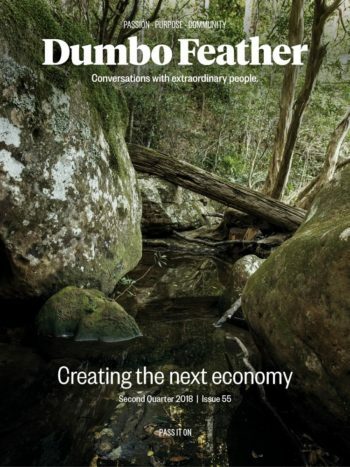 Using long, unedited, interviews to reveal these stories, Dumbo Feather showcases these makers as normal people who simply take pride in their labor, in turn making anything from the justice system to neuroscience more accessible and easy to understand. Issue #55, titled “creating the next economy”, to an extent implies Morris’s philosophies, with the cover starting a critical conversation about the relationship between the environment, economics, and the future of humanity. Openhouse is a sophisticated lifestyle magazine that speaks to culture fanatics and lovers of great stories that come attached to awesome spaces. Although the printed version of the magazine is impressive, its online footprint is noteworthy as a travel guide of sorts, alongside being an extremely pleasant user experience with textbook design and execution (the inconspicuous dot in the top left corner of the navigation is a nice touch). The difference here is that Openhouse, as its name implies, features creative people who open their homes to the public, sharing their life, work and experience. Issue 9, titled ‘A Woman’s Touch’, places emphasis on the life and spaces of influential women from around the world, including Georgia O’Keeffe, Alex Carro and Rosa Orrantia, to name a few. OZ was first introduced in Sydney, Australia, during the early ’60s but, debatably, the more-popular iteration of this magazine was its London-based version published during the latter part of the decade. OZ’s all-round editor, in Australia and Britain, was Richard Neville, who released the first issue of OZ London in 1967. 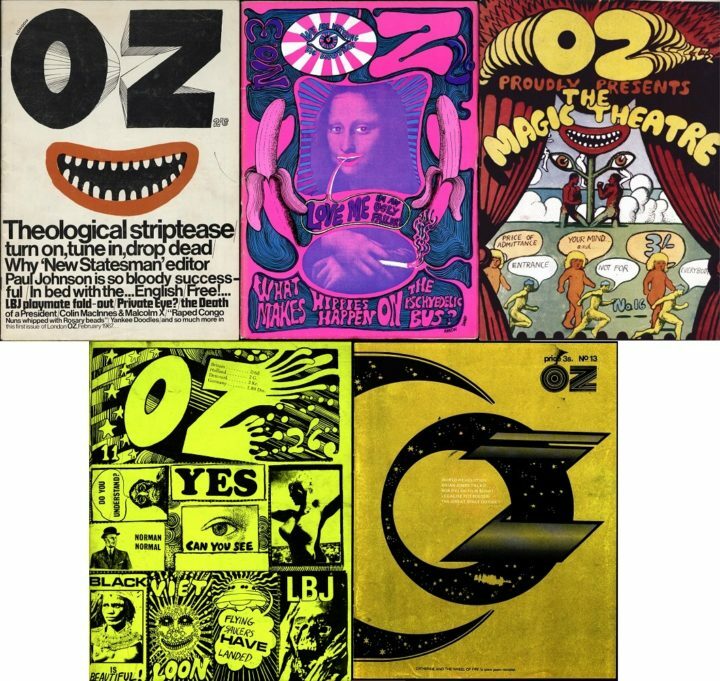 From its onset, OZ London adopted a strong psychedelic slant while maintaining the original satirical tinges of its Australian counterpart. A more-refined cultural and political perspective was applied with OZ London, despite its alternative and somewhat hedonistic inclinations. As such, the magazine became associated with the underground press, unapproved and anti-establishment, and great pride was taken in its obscenity trials, the first in Australia in 1964 and the second in Britain in 1971. Each trial resulted in acquittal for the magazine’s management, who narrowly avoided heavy jail terms for what was then considered highly controversial material to publish. Due to its often-controversial content, which included strong anti-Vietnam war sentiments, coverage on extremely alternative lifestyles and other subject matter that would torrent against the flow of the mainstream, the magazine had regular encounters with British authorities. This, alongside serious financial woes, would lead to the declining popularity of the magazine. The final issue, OZ #48, was printed in 1973.